A mother of three from Dorset died as a result of cannabis poisoning, an inquest has found. 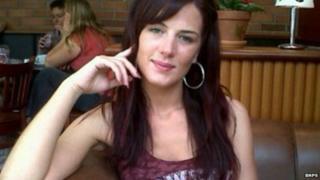 Gemma Moss, 31, from Boscombe in Bournemouth, had moderate to high levels in her system. A post-mortem examination found she died as a result of cannabis toxicity. It is thought she may have suffered a cardiac arrest triggered by the drug. Pro-cannabis group NORML UK said if she had taken a lethal dose, asphyxiation would be the cause of death. Bournemouth coroner Sherriff Payne recorded that Miss Moss died as a consequence of the abuse of drugs. NORML UK has called for a review of the circumstances surrounding Miss Moss's death "in order to determine what it was that actually killed her". Spokesman Greg de Hoedt said: "You'll need 20-40,000 joints to reach a lethal dose. "It is believed that asphyxiation would actually be the cause of death were this to happen." He also said it was "not uncommon to see real herbal cannabis sprayed with a synthetic high to increase potency". He questioned whether there had been any other hospital admissions in the area "for cannabis-induced tachycardia or other pulmonary problems". "Miss Moss's family deserve to know what actually happened, they do not deserve to have their family member's memory tainted by sensationalist and unscientific headlines and news reports," he added. David Raynes, of the National Drug Prevention Alliance, said deaths attributed just to cannabis were "rare" but had been recorded in other countries. "The production, in response to consumer demand, of ever higher strength cannabis, is bound to have some impact, as is the increasing use of cannabis distillate (liquid cannabis) which is becoming particularly prevalent in the US and Canada," he added. A coroner's officer confirmed that "extensive" tests had been conducted on Miss Moss, who died on 28 October last year. Russell White, a leader at the Citygate Church in Holdenhurst Road, said Miss Moss had been a worshipper for 18 months before her death. She was baptised in April last year and would often bring her young son to church. "Her death was a real shock, she is very much missed but definitely not forgotten. "Though her life was not easy as a single mum looking after two boys, she made the most of it by depending on God and her many friends for help." Mr White said Miss Moss's funeral was "one of the most sad but amazing times" with a congregation of 200 people.